I am working on an application for sharing a scanner. I have a webform for all the settings, a "Scan" button, and a "Preview" button. When the user press "Scan" nothing on the interface changes. A "Save As" window pops-up. But what should happen when the user press "Preview". 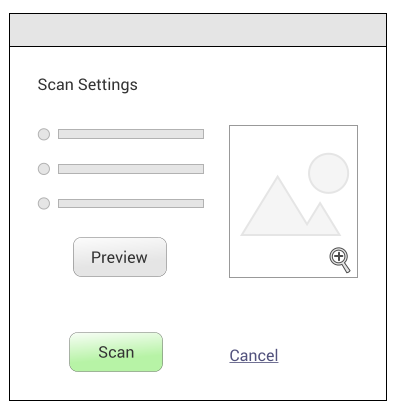 I was thinking about a dialog window containing the scanned preview, but the images are usually too big (1248x1640 for example)? You could try the following idea. Click on zoom control or preview picture opens bigger image. Not the answer you're looking for? Browse other questions tagged image modal-dialog panning or ask your own question. Panoramic images in a web context: good user experience examples? What are lightbox / modal window UI best practices for viewing full-sized images in a gallery? What is a suitable interface for exploring big images?